I have found that at this time of year, there is a certain air of well,’ fed-up-ness’. Unless you have had the fortune to have had a winter holiday, or some good luck find you, this time of year is usually the point when the most of us are simply F-E-D up with the winter and are seeking change. Didn’t the pagans have it right idea to mark the Spring Equinox – celebrating equal day and night – the tipping point as such – the winter definitely over and they could all look forward to longer and brighter days. Any excuse for a party. The Irish never really need one. Now I understand why St Patrick might have chosen this time of year to come to Ireland and preach the new word – the pagans being a bit more receptive perhaps to hearing some new slant on what might save them, or curious to learn what the stranger amongst them might have to say. Sure if it meant walking to the cross roads and a beyond bit more, to hear what the ‘foreigner’ had to say, and we meet a few new people along the way, we might feel all the better for it! 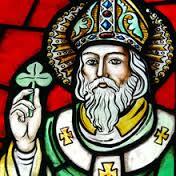 Patrick certainly gave a new perspective on things – and all with the use of a shamrock! In my years of acquired wisdom (and let me not fool myself, I will continue learning) I have found that when I can’t initiate the change – perhaps a new perspective is all that is needed. Or then again, maybe it is not so bad what I have and that if I look at it from a different angle, I might see a brighter side? When we were students in Kylemore, we would complain a lot this time of year. The term between Christmas and Easter always felt the longest. There wasn’t a whole lot to look forward to, and so classes would drag on, the food would appear all the more bland, the days all that bit colder and our teachers all that bit more annoying. We would all get a bit less tolerant of each other. 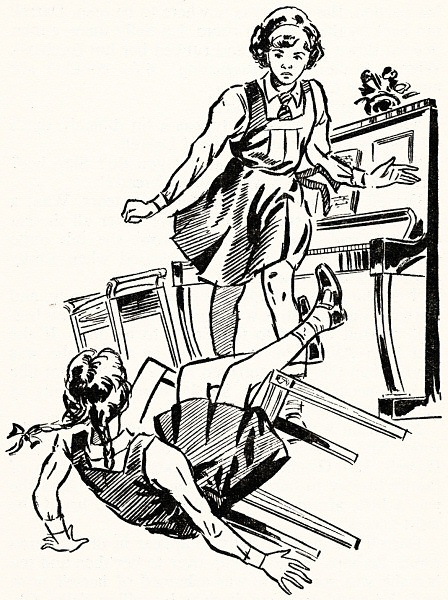 There was many a girl that would escape the confines of the school walls to get out and explore the estate within the acceptable boundaries for some fresh air, for a change of pace. At some point I took it upon myself to vary my route – I probably bounced it off a few friends, lets go this way for a change, or how about we go up that way, but for one reason or another, maybe even by choice, I ended up discovering new places to walk on my own. I followed a stream once, wondering how far I could stay with it – climbing up the side of the mountain, climbing over rocks and roots of trees, meandering around boulders trying to see if I could find its’ source. That was when I discovered a nice nook on the side of the hill. It gave a stunning view back towards the castle. Facing West, I could see the tower of the Gothic poking through the trees, and the castle beyond, and the land sweep on to the Atlantic to the edge of the eye. I later discovered that this resting point is called Lorenzo’s point – where the son of Mitchell Henry used to frequent. It too, became one of my favourites. Another of my favourite views, was the path that went up to the Mountain Lake. During our time in school (the 80’s), it was a popular enough walk. But I found over the years that less and less went there. Some 10 years later, on a return visit to the school, I raised the subject of the Mountain Lake with students, and asked if they walked that way at all. They had no idea of what I was talking about. ‘No, this path that goes up along the side of the hill that over looks the walled garden.’ I explain. You know if you were going towards Pat Neagh’s. ‘No, sure there is no lake up there. No, this path is hidden near the Jam House?’ I say. Anyway you get the jist of it. They had no idea of where I was talking about. For anyone going that way, the Jam House is now the old Salmon Spawning shed on the route towards the Walled Garden and the path is just beyond this to the right, the trees and creeping rhododendron hide it very well. 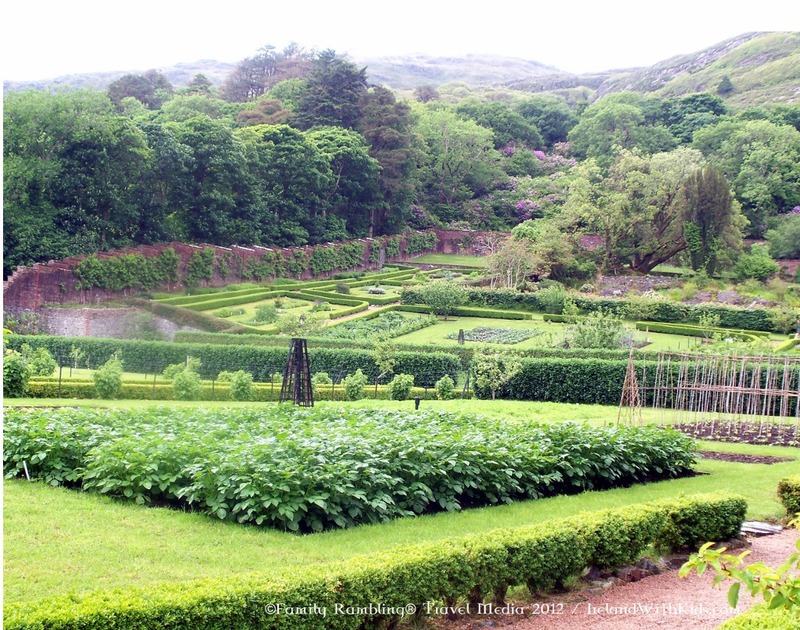 But if you follow that along, it brings you up the edge of the Duchruach Mountain offering an eagle view over the Walled Garden and if you have the energy to keep going, up to the mountain lake beyond with stunning views West to the Atlantic. 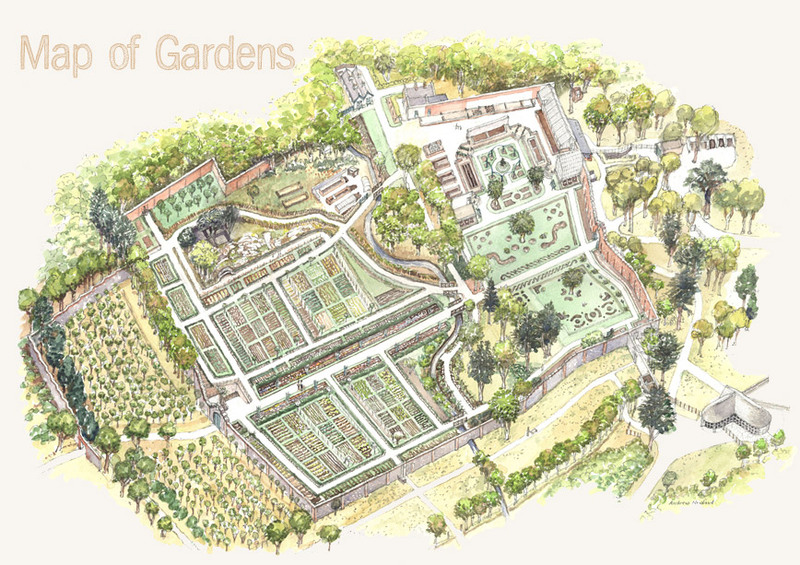 Here is the view of the walled garden as depicted in the brochures and how most people see it. And here it is from a different perspective.